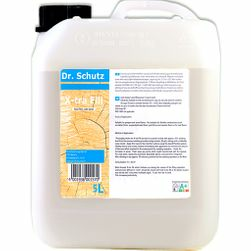 Repair scratches in luxury vinyl floors and polyurethane factory-finished floors with one of a kind Scratch Fix by Dr Schutz. 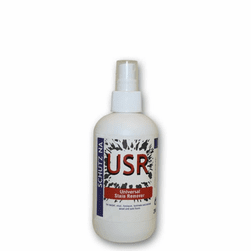 Easy to use, this scratch repair kit contains all that is needed to remove or reduce visibility of superficial scratches that penetrate the flooring wear layer. This is especially helpful to conceal scratch marks on Luxury Vinyl in schools, commercial spaces, retail stores, restaurants and can even be used at home. 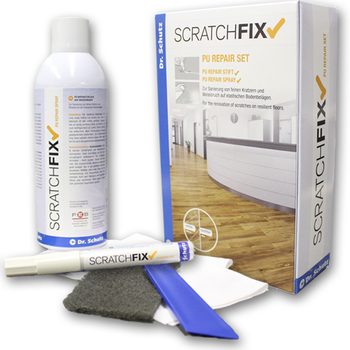 Scratchfix repair kit is designed for simple application so it's easy to fix minor superficial scuffing as well as longer scratches in the floor that look unsightly. All supplies are included in the scratch repair kit for fixing floor scratch marks. 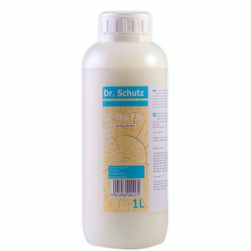 Videos showing how to use Dr Schutz scratch removal pen and scratch removal spray, as well as the other included buffing and scraping tools, are helpful and should be be viewed before flooring repairs are made. 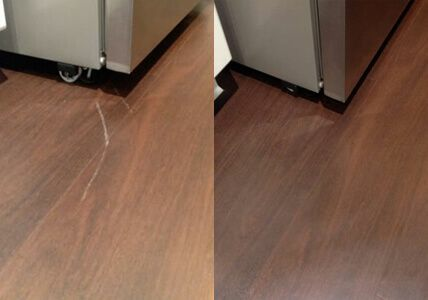 You may be able to repair blemishes on your vinyl flooring instead of having to do an expensive flooring replacement. 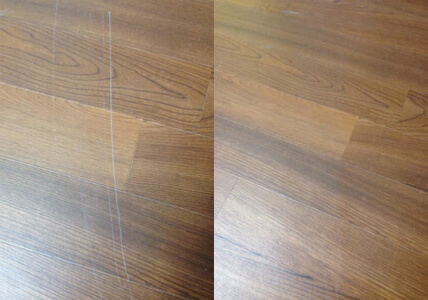 Use the scratch removal tools on luxury vinyl floors with a factory applied PU/PUR polyurethane coating. The scratch repair kit is engineered to accommodate most finished flooring gloss levels from natural matte finish to a medium satin gloss shine. It may take a bit of finesse to achieve the right gloss level for your specific application. Give a call to 1877FloorGuy Customer Support if you need guidance to achieve the right gloss level. Do a test to ensure compatibility and practice the repair on extra flooring material or in an out of the way area, such as a closet floor, before making a repair in the middle of your dining room or store flooring. 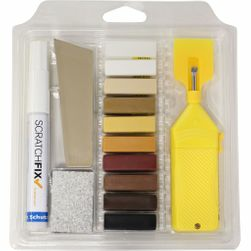 Like most things, practicing with the floor repair tools in this scratch repair kit will make your application better and ensure that the finish gloss level is compatible with your specific floor. 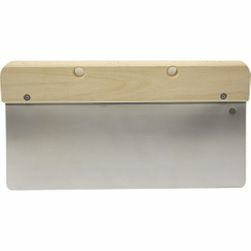 Directions for use: Clean area making sure it is free of any dirt, grease and any existing polish or acrylic finish. ScratchFix will only work when applied to the factory finish. 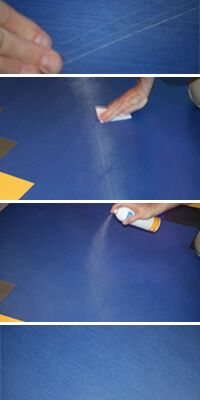 Lightly sand the damaged area using the abrasive grey pad provided in the vinyl floor repair kit to smooth out any rough areas caused by the scratches. Remove any dust created during sanding using a slightly moist cloth. Allow area to dry. Rigorously shake the ScratchFix Repair Spray for 20 seconds. Spray damaged area forming a fine mist on the floor. For best results apply 2-3 coats. Allowing 5-10 minutes of drying time between coats. Read the included full kit instruction sheet prior to use. IMPORTANT: Gloss level between the repaired area and the factory finish may differ. Always test vinyl floor repair kit products on left over material or in an inconspicuous area prior to the repair to be sure you will be satisfied with the results.